Gallery Street is a shopper's heaven. If you are looking to furnish your house with pictures or carpets, buy modern Judaica as a present for a friend, or just want a souvenir, Gallery Street is the place to be. 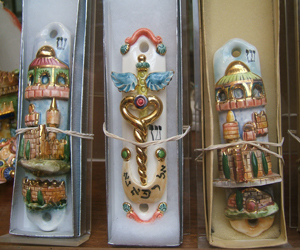 Whether you just want to spend pocket change or prefer to max out your credit card, you are bound to find something you like, or even fall in love with, to take home as a memento of your time in Safed. If you look at the city map at the Ari synagogue, you will see nearby a street called Alkabetz, named after the composer of Lecha Dodi, the Friday night hymn. The main parking lot at the end of the street is called Beit Josef or Joseph Caro Street, after the Rabbi who wrote the Shulchan Arach (Code of Jewish Laws). If you're at the Ari Ashkanazi synagogue, walk out of the Ari's courtyard and turn right to walk down the stairs. At the bottom of the stairs, turn left. That's Alkabetz Street which leads down the street of galleries and shops and then back to the bus parking lot. If you come from the bus parking lot, walk into the Old City through Yosef Caro Lane, identifiable by its arched roof. Walk through the lane towards the stairs that lead to the Ari Ashkanazi synagogue. As you walk down the shopping arcade, there are lots of small shops and stalls on both sides of the street, as well as much larger ones like the Fig Tree Courtyard. This is a whole set of shops in itself, set around a courtyard, which has a historic water cistern and a fig tree. These shops offer modern and classical Israeli art as well as Middle Eastern carpets, jewelry, leatherwork and wine. You can also see the remains of the Lemberg Synagogue which was built in the 1840's. The Lemberg synagogue collapsed during the First World War, about half-way down the lane, across from the stairs leading to the Abuhav winery. There are many more shops to visit and if you are looking for modern Judaica why not go into Sarah's Tent which has a good selection of menorahs and Seder plates. The Canaan Gallery, a weaving workshop making prayer shawls, also has beautiful modern Judaica. Their restaurant is a good place to stop if you need a bite to eat and has a wonderful view toward Mt. Meron. Next door to the large Camus Gallery which offers jewelry, art and more traditional Judaica, you will find the Josef Caro Synagogue with its very old Torah Scrolls. If you want to see artists at work why not stop in at Josh Burde, a silversmith, who has original designs; Moshe Yair, a micro-calligrapher; or the work of Yaacov Kaszemacher, a mixed media artist whose son now exhibits his father's unique paintings. Just up a few steps above the street, about half way down, is a children's playground and small park, with a seating area for individuals and groups, where you can stop and have a rest. Tucked away on the left, towards the end of the street as you continue down, is the simple Old City's women's mikva (ritual bath house). Opening hours are posted on the door, together with a contact phone number. The shops will ship your purchases home so you don't have to restrict yourself to something small that you can slip into your pocketbook. With so many wonderful things to choose from you may find yourself slipping back up the street to buy something that you realize you just can't live without. ©2018 Safed.co.il All rights reserved.